Love it so much you geniuses. Do you mean antidote? Yes!! I did mean antidote! Thanks so much 🙂 I need all those extra “eyes” out there!! Everyone who has tasted it so far has loved it and raved over it. Thank You so much! Thanks so much for taking the time to give us feedback Meera, so happy you have enjoyed it! Thanks for your comment. It’s delicious with any type of lettuce and great on just a simple green salad. I just made this dressing and it’s so good! I’ve found it tastes great over mixed greens with avocado, strawberries, and sliced almonds. Hope that helps! Ok…Ramella again…so I didn’t wait for the flavors to meld. I had grilled boneless jerk Chicken breast. The dressing was absolutely fabulous. I had just a tad left so today, Monday, June 19th, 2016 made your dressing again…my mangos were very ripe. I changed my olive oil to Bertolli EVOO. I also purchased Fresco Red Peppers…while it was still slightly thick it was better than the one I made yesterday…Oh my…I can’t wait to serve this to my guest. Thank you for sharing. Thank you Ramella, so happy you enjoyed this. You could always thin this with a little extra orange juice if it’s too thick for you. I’m glad you tried it with a different oil too. It can make a big difference! Hope your guests enjoy it! I just made your dressing. I did not have Fresno peppers so I used jalapeño. I find that the dressing is slightly thick and carries the taste of olive oil (Colavital Extra Verging Olive Oil). I’m going to let it sit for a day or so to allow the flavors to meld. Why would the dressing be slightly thick? It smells awesome. This is the recipe that led me to your site. I’m now a subscriber, after seeing all the recipes you have to offer. So glad you came by Eileen! And thanks for joining us here at The Café! I Love this! I’ve started a Reboot program for my health and part of it is eating a healthy lunch and dinner so I’m gathering up lots of salad and salad dressing ideas and this is a winner! This dressing is such a pretty color and looks sooo good! I love the pitcher too – may I ask where you got it? A Paris flea market, of all places Teresa! Scott and I are always on the prowl for fun, unique props for TCSF! Hi Chris. I would definitely like to try this recipe. May I know if I can substitute lemon juice for lime juice since lime is not an easy find in my area. Thanks. 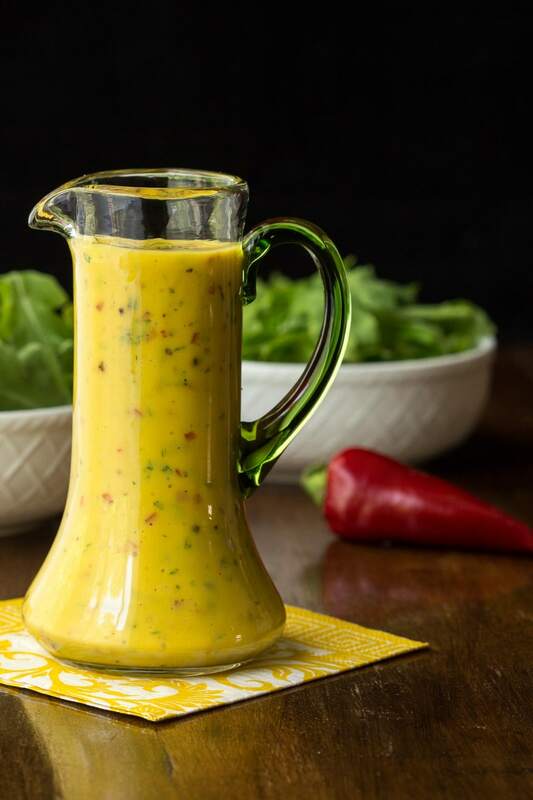 You are the Queen of Salads and this dressing is a beauty. I can only imagine how great it would be to have this in the middle of winter. 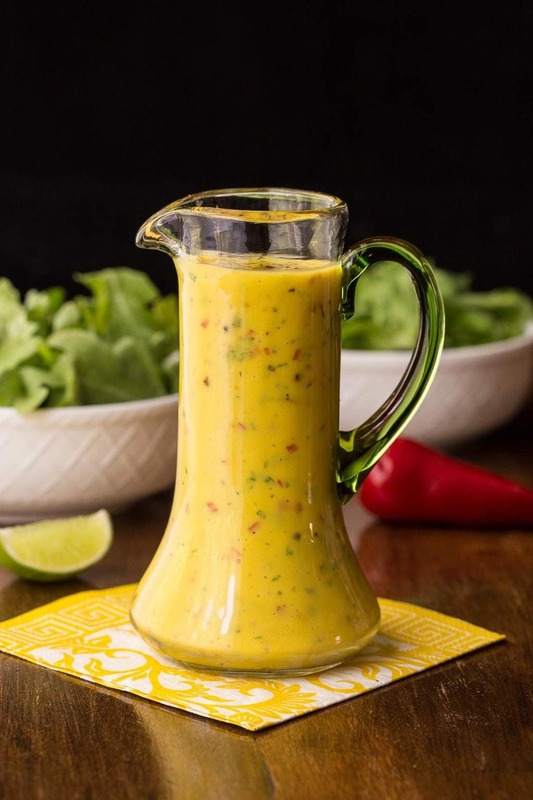 This dressing looks amazing! I could just drink it. And I love how it could go on pretty much any salad I make. YUM! I’m not sure whether I’d eat it or just want to look at how beautiful it is! Such a gorgeous color and those flecks of cilantro and chili peppers are so beautiful. When we overeat on the weekends, salad dinners are always on the menu for Monday night (and sometimes Tuesday too if we’ve really over indulged!). Gorgeous, Chris! This is a winning recipe. 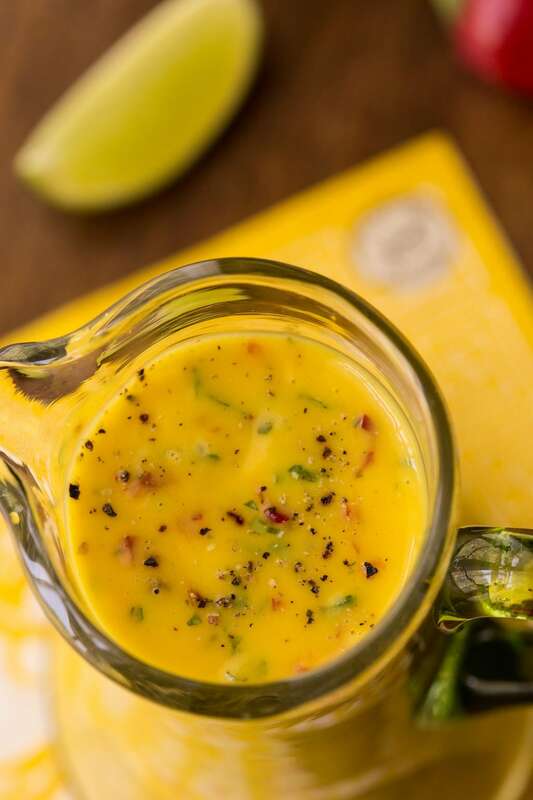 I love the combination of sweet, spicy, and citrus, that you’ve put together in the recipe. Wonderful! 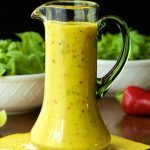 Mango salad dressing??? I’d be pouring this winner over everything, too!!! And it’s gorgeous, too. What a colorful, beautiful, delicious dressing, Chris. 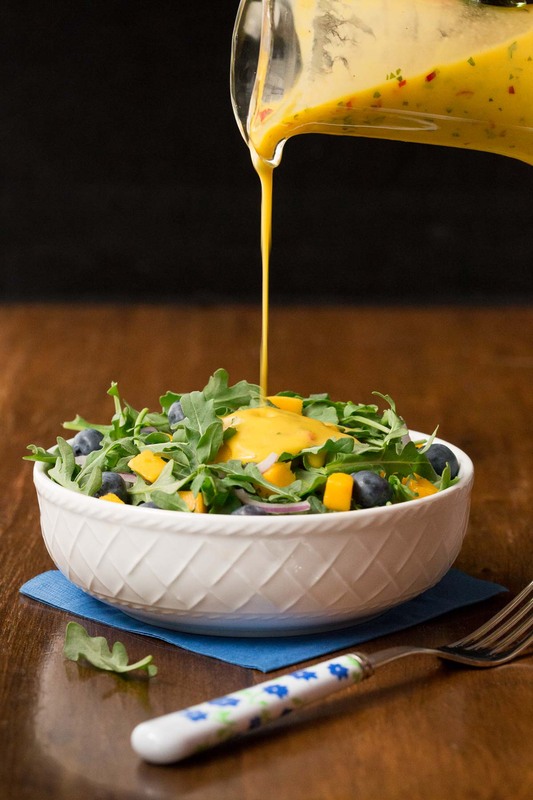 Dear Chris, you are certainly an expert at creating the most exiting salad dressings ever – just look at that color and the wonderful ingredients. You managed to combine so many delightful flavor components – a certain hard-to-resist recipe indeed! 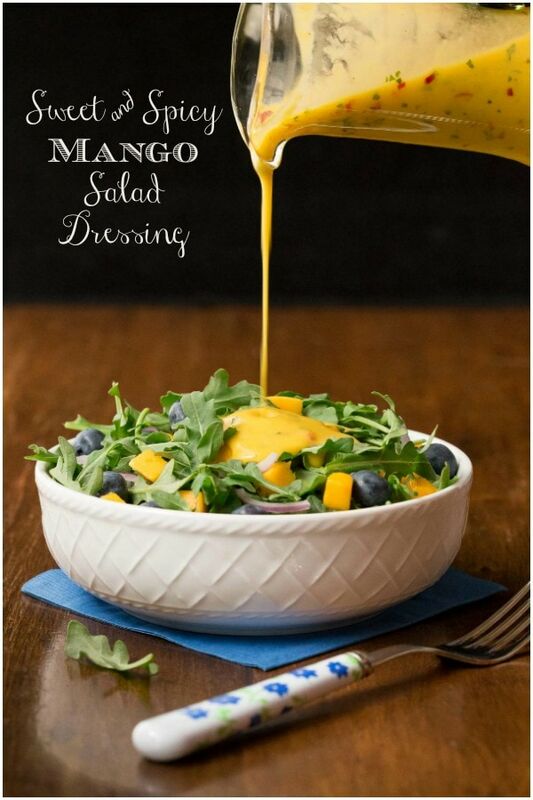 I love mangoes, what an incredible dressing! I love mango in salads and have been going overboard with it..what’s one more time righ? :)Thank you..GORGEOUS. Have a lovely weekend, Chris! Love the ingredients in this dressing. Will definitely try this out. Hi Chris, I think I would be able to drink this in the mornings to get me going , Wow! love everything about this! I can see this dressing on a salad and fruit salad. Chris I love the sound of this dressing. Not only is it beautiful but the combination of ingredients sounds fantastic! I will definitely be making this. Thanks Vickie, hope you enjoy it as much as we have! Does this dressing freeze please? I’m not sure about freezing. I have a feeling it would separate but I’ve never tried it. The very thought of this drives me crazy — the sweet, the spicy, the cilantro — all my favorites! Thanks Sue, you and I have the same favorites!